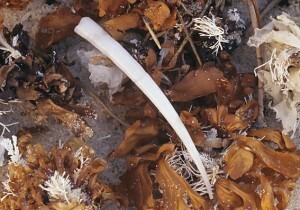 The Smooth Tusk Shell, growing to 65mm in length is one of the larger species of scaphopod. Like other tusk shells, it lives embedded in sand and the living animal is rarely seen. However, sometimes specimens are washed ashore after rough weather. Although the shell of this species is smooth, many other species of scaphopod may have pronounced raised ribs running the length of the shell.